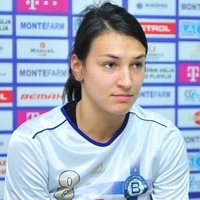 Romanian Cristina Neagu is the latest reinforcement for Budućnost. The former Oltchim RM. Valcea player and 2010 World Handball Player of the Year signed a one year contract with the 2012 Women’s EHF Champions league winner. “I am happy to join Budućnost. I want to get back into shape after a series of injuries,” stated Neagu. The 24-year-old, who in the past spent 20 months off court due to a serious shoulder injury, had a knee operation on 7 February and she will return to training at the end of August. “My shoulder is good, and as for the knee injury, I hope to be back on the court at the end of summer,” added Neagu. Budućnost also presented two of three more reinforcements for the upcoming season, Dane Camilla Dalby and Polish player Kinga Byzdra, coming from Randers HK and KGHM Metraco Zaglebie Lubin respectively. These reinforcements are a serious statement of intent from Budućnost, who will be one of the likely contenders to reach the latter stages of Europe’s top flight next season. “It’s the first time I am going to play outside of Denmark and I am very excited about it. I feel that I made the right choice. I want to improve along with the team,” said right back Dalby. Only Croatian goalkeeper Marta Žderić was missing from official presentation, because of obligations to her former club Podravka. “I chose Budućnost because I want to improve. Handball is my life, I have played it since I was eight and my parents were also engaged in this sport. “Coming to Budućnost I made the right move. I'm happy to play in the EHF Champions League,” Byzdra said. These signings have come at a good time after five players from last season’s squad left the club: Anđela Bulatović (to Krim Mercator), Claudine Mendy (Vardar), Jelena Trifunović (Podravka), Jelena Živković (Podravka) and Katarina Bralo. Budućnost’s club director Bojana Popović said that she was pleased with the new arrivals, the ambitions of the Montenegrin club and new players coincided, so all deals were quickly agreed. “We are pleased that, despite having received more attractive financial offers, they decided to come to Budućnost. “Our new players want to play in the Champions League and to win a trophy. “They want to improve, to play in the club system that has been recognised in Europe. “They will be able to upgrade every aspect of the game, especially the defence. “We have to be patient, but it is clear that we are working on long terms,” admitted Popović. “The system of work in our club is not easy, but when new players will fit into the system, I think they will prove to be the right reinforcements. “We have new players who are primarily reinforcements for attack, but the defence will continue to be the main asset of our team,” concluded Popović. Budućnost’ coach Dragan Adžić was also pleased that he will have the opportunity to work with such quality players. “I'm glad that these players have chosen our club and that we are in a position to be able to bring quality players from diverse countries. “That’s possible now thanks to Bojana Popović, since previously it was not possible to imagine. “However, in the meantime Budućnost became EHF Champions League winner, and players are happy to come to our club. Excellent players came to Budućnost, they will have no problem to adapt to the attacking play. “The defence will be a bit more difficult, especially after the departure of Anđela Bulatović and as Suzana Lazović recovers during the first part of next season. “The new players are reinforcements in the attack at a high level, but defence is something that brings victories and in the next season it will be the primary objective for all Budućnost players,” concluded Adžić, who will continue to be on the lookout for new signings before the team begin pre-season preparations in July.